How to Book a Wedcation! 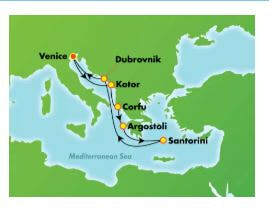 Enjoy a fascinating weeklong cruise from Venice, exploring the Greek Isles and also stopping at Montenegro and Croatia. Discover Kotor, a beautiful walled medieval city of twisting, pink-paved streets, markets and architecture reflecting Byzantine to Venetian influences. While in Santorini, visit the beautiful whitewashed hilltop towns of Oia and Fira and their breathtaking views of the caldera below. And enjoy wandering through the narrow, winding streets of Mykonos, a delightful seaside village with its whitewashed houses, flowers and brightly painted shutters and doors. Explore the Greek Isles, Montenegro and Croatia. Norwegian Star was recently enhanced in 2018. ​Norwegian Star blends the relaxed Freestyle Cruising concept with cruises to The Caribbean, Europe, Mexican Riviera, South America, Panama Canal, and Transatlantic. On board, Norwegian Star features 15 delicious dining options, 10 bars and lounges, a sprawling spa, an always-exciting casino, plus tons of fun for kids of every age. So whether you're exploring Northern Europe, sipping Piña Coladas in The Caribbean, or crossing the Atlantic, this ship offers it all. Mini suite, Balcony, Ocean View and obstructed ocean view.